Astrophotographer Scott MacNeill sent in this image of Saturn and moons: Titan (left), Tethys (top center), Dione (mid center), Rhea (bottom center), and Enceladus (right). He took the image from the Frosty Drew Observatory in Charlestown, R.I on May 18, 2013. Astronomers from around the world put the stars and planets on display for the people of Indianapolis last week. For the first time, the members of the American Astronomical Society (AAS) hosted events specifically geared toward people from all walks of life during the society's 222nd meeting last week. Scientists teamed up with amateur astronomers from the Indiana Astronomical Society to set up telescopes outside of the Indiana Convention Center in downtown Indianapolis on June 3. A family coming from a graduation ceremony in the convention center stopped by the event when they saw telescopes set up across the street. "I took an astronomy class in college, but this is probably a new experience for them," said the mother as she pointed to her two small children looking through telescopes on the lawn. 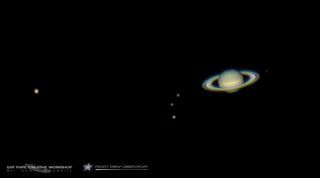 "This is my first time, I thought it was really cool," said the son after he spied Saturn. "I didn't expect it to be as light. It looked more like a star than a planet." Some AAS members brought their children out to take part in the fun as well. One young child sporting a mohawk looked through a telescope similar to the one Galileo Galilei used when he observed Saturn for the first time before moving on to a telescope powerful enough to clearly display a few of the ringed wonder's moons. Mimas — the so called "Death Star" moon orbiting Saturn — was prominently on display with Titan, the planet's largest moon, in the same field of view. "Did you see the coolest moon?" a dad asked his son before they moved on to a different telescope. "Do you see why they call it the 'Death Star' moon?" Some stargazers were also treated to a coincidental flyover by the International Space Station during the skywatching session. The event marked the first time the AAS has invited members of the public to take part in the twice-annual conference. AAS officials invited experts to give half hour talks geared toward a non-scientist audience for two days in Indianapolis. The lectures ranged in topic from the birth of the universe to possible interstellar destinations for humans in future missions to space. Other talks focused on Pluto's storied history as a planet and nearby exoplanets.